Thoreau thought that people worked too hard, and did not have enough time to devote to the really important things in life. To find out how hard scientists are working now, my colleagues Ahimsa Campos-Arceiz, Lian Pin Koh and I analyzed the day and time of submission for 10,000 manuscript submissions and almost 15,000 reviews sent to the scientific journal Biological Conservation. Ahimsa Campos-Arceiz, one of the authors of the study, reviewing a manuscript while traveling to a field site in Malaysia. Our results showed that these scientists do a substantial amount of their work late at night (16% of the manuscripts) and on weekends (11% of the manuscripts and 12% of the reviews); and that this work outside of normal hours has been increasing at about 5-6% per year. Japanese and Mexican scientists stood out for working late at night and Chinese and Indian scientists worked far more than average on weekends. In contrast, Belgian and Norwegian scientists did not work much on weekends, and Finnish scientists did not work at night. American and British scientists had average work habits, working moderate amounts on weekends and evenings. Overall this study shows that conservation biologists and potentially other scientists and academics do a considerable amount of their work outside of what we generally consider regular working hours. This can negatively affect the scientists’ life-work balance, impacting relationships with family and friends, physical exercise, or just resting time. However, is it possible that conservation biologists just enjoy what they are doing and for them it is not all work. After all, Thoreau must have spent lots of his evenings and weekends writing what amounts to 2 million words in his journals! 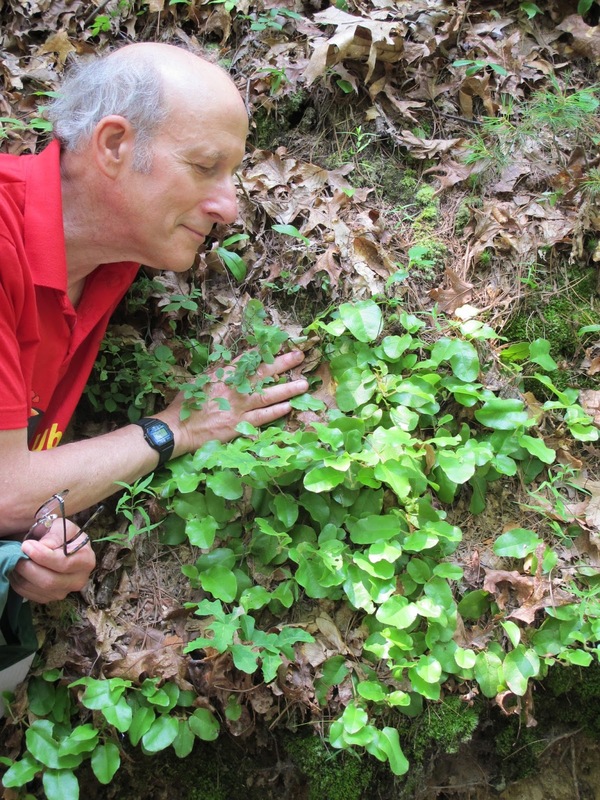 Richard examines a patch of trailing arbutus cascading down a forested slope in Concord. This site does not have public access. The single trailing arbutus plant that grew for many years next to the trail around Walden Pond recently died. Trailing arbutus is known botanically as Epigaea repens, or more familiarly as mayflower, and is the Massachusetts state flower. It is recognized by fragrant pink flowers produced below ovate, evergreen leaves that sprawl across the ground. Henry David Thoreau referenced trailing arbutus many times in his journals during the 1850s, noting its spring flowering time. He found it at about three localities in Concord. Later botanists have noted half a dozen additional Concord sites for this species. I have seen three small patches in Concord, with the Walden Pond plant being the only one that was readily accessible to the public. I have shown this isolated plant to dozens of students and nature lovers during walks around the pond. Now the plant is dead and only dried brown leaves remain. Visitors to Walden Pond are no longer able to observe and enjoy this beautiful and iconic wildflower. The dead trailing arbutus plant growing on the edge of the Walden Pond trail. The decline of trailing arbutus and other wildflowers in Concord demonstrates that simply protecting land is not enough to preserve the diversity of life. Sometimes we must take action to reduce these threats if we wish particular species to remain on the landscape. Such actions include removing deer and invasive species, maintaining open river meadows through mowing and tree cutting, and restoring lost species. Without such management actions, we will not experience the diversity of wildflowers, butterflies, birds, and other species that enriched the life of Thoreau and inspired his writing. While we have already lost the trailing arbutus at Walden Pond, its loss may serve as a call to action for the protection of nature.